As I post this recipe today, I’m reminded that I’ve already posted a similar recipe twice already. So, that’s three different spicy pasta sauce recipes for your choosing. One, two, three. Clearly this is a favorite dish in our home. So good, in fact, that I forgot I’ve already shared something similar with you– twice before. Does it matter? Not really. Because this version is slightly different and just as delicious. It’s the perfect weekend dinner, which is why I’m sending it out to you today. 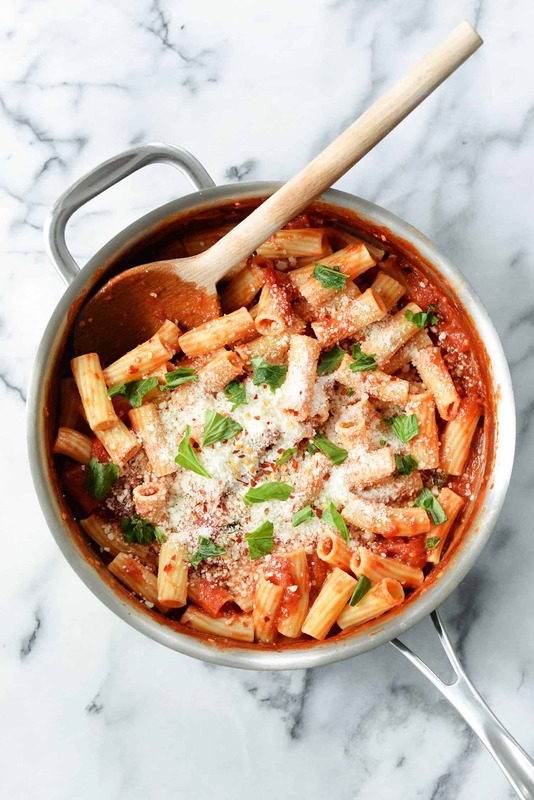 I’m fairly certain you’ve already got all of the ingredients in your pantry already (perhaps minus the fresh basil), so you’re 99% of the way there. Make this one soon. Here’s the secret to this sauce, a trick I learned from Katie of Katie’s Pizza and Pasta here in St. Louis (one of my favorite restaurants if you’re looking for good STL eats.) 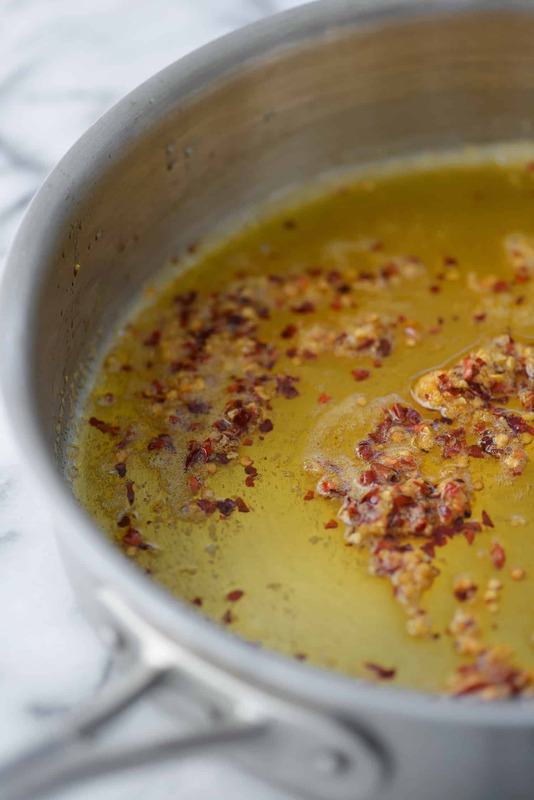 Sauce the garlic and crushed red pepper in both olive oil and butter. The butter (a vegan version works!) 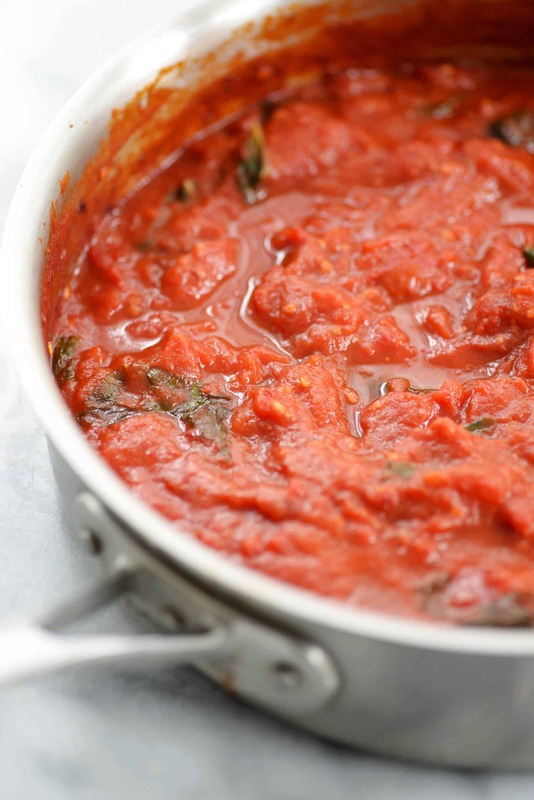 offers more complex flavor than the olive oil, while helping to emulsify the crushed tomatoes into a sauce. Cooking the red pepper flakes in this fatty goodness helps impart spice throughout the entire dish. Then, you’ll add whole tomatoes that you’ll crush with the back of a wooden spoon as the sauce cooks. It’s really important to use good tomatoes here. Spend the extra dollar, it’s worth it. I made this dish with generic tomatoes and then made it again with the good stuff (you know the kind, the $2-3 can of whole tomatoes) and it was so much better than the first version. I know this to be true when I make my homemade red sauce, so why did I think it would be any different with whole tomatoes? Add the tomatoes to the pepper mixture then slowly cook, crushing the tomatoes to make a chunky sauce. If you’re using the good tomatoes, they should mash fairly easily, but you might have to remove any tough stem ends with your hands. This is especially true if you opt for the generic tomatoes. Then, add in the basil leaves and cooked pasta. Drizzle in a little of the reserved pasta cooking water to allow the sauce to really stick to the pasta. Add cheese, if desired, and serve. Here’s the question you will end up asking yourself: how can something so simple, be so good? And, that’s really the beauty of most pasta dishes. They take minimal effort to prepare, with dynamite flavor. Perhaps that’s why we enjoy a bowl at least once a week. P.S.- Have you entered the Dreamfields contest that I shared with you earlier this week? Head here to enter to win amazing prizes, like a $1000 gift card, a year of pasta, an Apple watch and more. Spicy Arrabbiata Sauce! 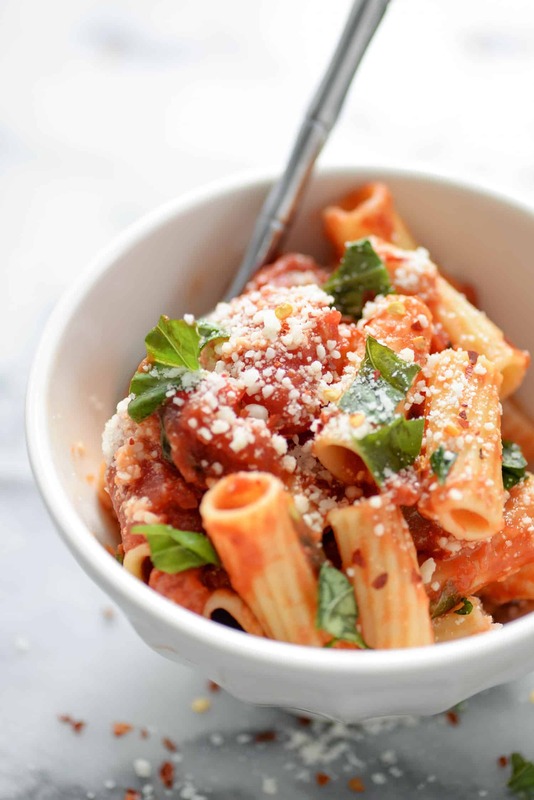 If you like heat then you’ve gotta try this healthy pasta sauce. Homemade tomato sauce with crushed red pepper and lots of garlic. Delicious and healthy! Heat the butter and olive oil in large skillet over medium heat. Add the garlic and chili flakes and cook until garlic is soft, stirring often. Take care not to burn the garlic, it will ruin the sauce if it becomes too browned. Add the tomatoes and the juice to the pan, breaking up the tomatoes with a wooden spoon as you stir. If your tomatoes have tough ends, remove them from the pan all together. I like sauce with just a little texture, but break down the tomatoes to your liking. Simmer for 30 minutes until thickened, stirring occasionally. While the sauce is cooking, make your pasta (or whatever you are serving this with.) I like a hearty tube pasta, but anything kind will work. Reserve 1/2 cup pasta water before draining pasta. Stir in the basil leaves and season with salt. I start with 1/2-3/4 teaspoon salt and add more if needed. If you used salted tomatoes, you won’t need as much. If serving with pasta, add the just al dente pasta (I undercook by a minute or two to finish cooking in the sauce) along with a tablespoon of pasta water. Stir to combine, adding more pasta water a tablespoon at a time to loosen the sauce. Season to taste and serve immediately. Delicious with parmesan or vegan parmesan cheese and extra fresh basil. This recipe is amazing! Everything in it utilizes ingredients we always have at home (I used dried basil rather than fresh, but it tasted just as good) and it was super easy to make. I added some slicked andouille sausage (I wanted to go with Italian sausage, but the grocery store in my small town has limited options) and it tasted great with the hearty, spicy sauce. My boyfriend had three helpings! I definitely plan on making this again soon. So glad you like it! Thanks Laura! Hey Alex! Is it necessary to use canned tomatoes? Or will fresh tomatoes work as well in place of the canned ones? Hi Artemis- fresh tomatoes should work, though you will likely need to cook it longer. Let me know how it works out!